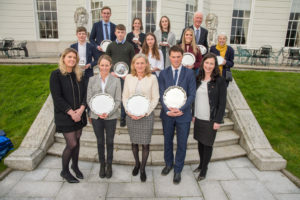 A Clare show jumper was among the award winners at the Irish Field Equestrian Awards which took place at the K Club in Kildare on Monday. Rhys Williams picked up the Junior Show Jumper Award. 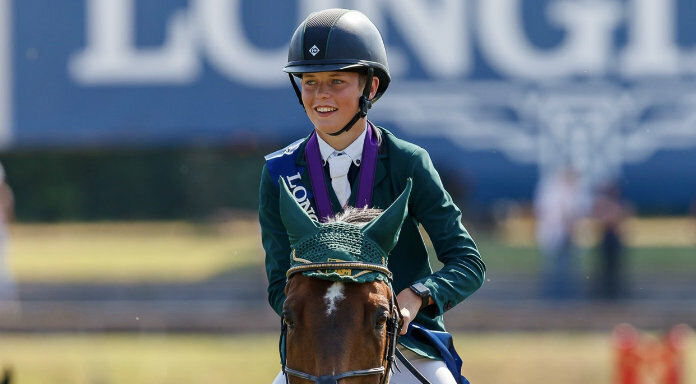 The 13-year-old from the Ennis-based PARC Stables, won the individual gold medal at the FEI European Championships last July and was also part of the Irish under 14 team that won silver at the same event. His name is added to showjumping greats of years gone by such as Jessica Kurten, James Kernan, Billy Toomey, Shane Breen. In fact, the only other Co Clare name on the trophy is Tom Costello who won it in 1979. So its 40 years since the trophy was brought home to Clare. The award has been in place for over half a century. Words can’t describe it, I am delighted,” those were the feeling of 13-year-old Co Clare teenager Rhys Williams after he won the Individual Gold Medal at the Longines FEI Children on Horses European Championships last July with Marie Burke’s 11-year-old Chippison gelding CES Cruson. Under Irish Young Team Manager, James Kernan, Rhys and CES Cruson were the only combination to jump clear over three rounds to clinch the Gold Medal from German riders in second and third. The son of Adrian and Paula Williams from Ennis, Rhys was also part of the winning Gain Equine Nutrition-sponsored Under 14 Irish team who scooped Team Silver at the Championships where he joined his team mates Lucy Morton, Sarah Fitzgerald, Ciaran Foley and Isobel Hughes Kennedy on the podium. Rhys was described as a “real star of the future’’ by James Kernan who said the young rider showed “nerves of steel’’ and gave an exhibition of jumping’’ to take Individual Gold. On home soil, Rhys enjoyed wins with the Kate Wachman-owned Sligo Lux to Queeney in the Coolmore Pony Premier Series at The Meadows in April and in June at Ennis Showgrounds; victory in the Small Horse Discovery Final at Millstreet International Two-Star Show with Adrian Williams’ Fast And Furious. Back row (l-r) Paul Kennedy, Judy Reynolds, Hannah Woodworth, Paul McAuley. Middle row (l-r) Rhys Williams, Seamus Hughes Kennedy, Sophie Foyle, Robyn Moran, Ruth Rogers. Front row (l-r) Nikki Wallace of Gain Equine Nutrition, Sarah Ennis, Sally Corscadden, Sam Watson and Joanne Hurley of Gain Equine Nutrition. STAR OF THE MONTH Awards, jointly sponsored by Gain Equine Nutrition and The Irish Field. JULY: Rhys Williams: Ennis teenage show jumper Rhys Williams (13) returned home from the Children on Horses European Championships with a Gold Medal. Riding Marie Burke’s CES Cruson, Rhys was the only rider to keep a clean sheet over no less than five rounds of jumping to win the Individual Gold Medal. Not only that, but Rhys and CES Cruson were also part of the Irish team who took home Team Silver from the event. Coached by his father Adrian and mother Paula, show jumping is all the talk of the Williams household with his brother Coen and sister Scarlett all very much involved.